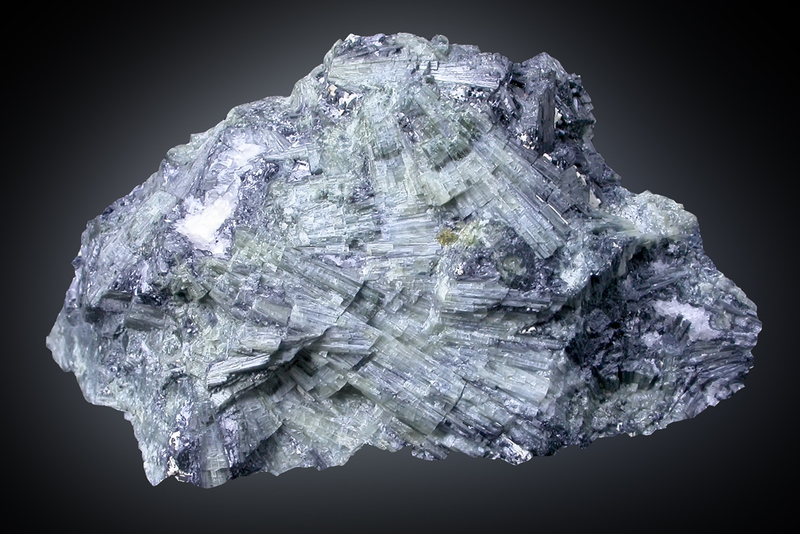 Rossmanite: Mineral information, data and localities. 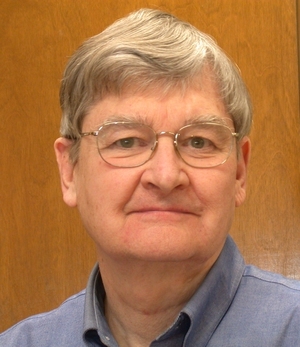 Named after George R. Rossman (b. August 3, 1944), California Institute of Technology, Pasadena, California, USA, in recognition for his work on the spectroscopy of the tourmaline-group minerals (and many other mineral species). Vacancy-dominant member; identification only possible with quantitative chemical analysis and/or crystal-structure refinement. Visit gemdat.org for gemological information about Rossmanite. Sample from Czech Republic has: a = 15.770(2), c = 7.085(1) Å.
Elbaite 2 photos of Rossmanite associated with Elbaite on mindat.org. Quartz 2 photos of Rossmanite associated with Quartz on mindat.org. Foitite 1 photo of Rossmanite associated with Foitite on mindat.org. Selway, J.B., Novák, M., Hawthorne, F.C., Cerny, P., Ottolini, L., and Kyser, T.K. (1998) Rossmanite, ◻(LiAl2)Al6(Si6O18)(BO3)3(OH)4, a new alkali-deficient tourmaline: Description and crystal structure. American Mineralogist 83, 896–900. The following Rossmanite specimens are currently listed for sale on minfind.com. Wilson, W E (2012) Famous Mimeral localities: The Jonas Mine, Itatiaia, Minas Gerais, Brazil. Mineralogical Record 43:289-317. Dixon, A. (2014, October). Mount Begbie Pegmatite Group, British Columbia, Canada–evolution from Barren to Complex Rare-element Pegmatites. In 2014 GSA Annual Meeting in Vancouver, British Columbia. Can Min.38:877-891; Selway, J. B.; Cerny, P.; Hawthorne, F. C.; Novak, M. (2000): The Tanco pegmatite at Bernic lake, Manitoba. XIV. Internal tourmaline. Canadian Mineralogist 38, 877-891. Selway JB, Novák M, Cerný P, Hawthorne FC. (2000) Compositional evolution of tourmaline in lepidolite-subtype pegmatites. European Journal of Mineralogy, 11, 569-584.; Černý, O., Teertstra, D.K., Chapman, R., Selway, J.B., Hawthorne, F.C., Ferreira, K., Chackowsky, L.E., Wang, X.J. & and Meintzer, R.E. (2012); Černý, P., Teertstra, D. K., Chapman, R., Selway, J. B., Hawthorne, F. C., Ferreira, K., ... & Meintzer, R. E. (2012). Extreme Fractionation And Deformation Of The Leucogranite–Pegmatite Suite At Red Cross Lake, Manitoba, Canada. Iv. Mineralogy. The Canadian Mineralogist, 50(6), 1839-1875. Zhang AC, Wang Ru, Hu H, Chen XM (2004) Occurrences of foitite and rossmanite from the Koktokay No. 3 pegmatite dyke, Altai, Northwestern China: A record of hydrothermal fluids. Canadian Mineralogist, 42, 873-883. Novák, M., Staněk, J.: Lepidolitový pegmatit od Dobré Vody u Velkého Meziříčí, západní Morava. Acta Musei Moraviae, Scientiae geologicae, 1999, roč. 84, s. 3 - 44. Selway J. B., Novák M., Cerný P., Hawthorne F. C., 1999, Compositional evolution of tourmaline in lepidolite-subtype pegmatites. European Journal of Mineralogy, 11:569-584. Am. Mineral. (1998) 83, 896–900; Novak, M., & Cerny, P. (2001). Distinctive compositional trends in columbite-tantalite from two segments of the lepidolite pegmatite at Rozna Western Moravia, Czech Republic. Journal of GEOsciences, 46(1-2), 1-8. A. Ertl, U. Kolitsch, H.-P. Meyer, T. Ludwig, C. L. Lengauer, L. Nasdala and E. Tillmanns (2009): Substitution mechanism in tourmalines of the “fluor-elbaite”-rossmanite series from Wolkenburg, Saxony, Germany. N. Jahrb. Mineral. Abh. 185, 51-61. Diella, V., Pezzotta, F., Bocchio, R., Marinoni, N., Cámara, F., Langone, A., Adamo, I., Lanzafame, G. (2018): Gem-quality tourmaline from LCT pegmatite in Adamello Massif, Central Southern Alps, Italy: An investigation of its mineralogy, crystallography and 3D inclusions. Minerals 8, 593. F. Pezzotta, A. Guastoni, C. Aurisicchio (1998) - La rossmanite di Roznà e dell'Elba. - Riv. Mineral. It., 22 2: 46-50. Buřival, Z. & Novàk, M. (2015): Hydrothermal replacement of garnet by tourmaline in elbaite subtype LCT pegmatites. In PEG 2015: 7th International Symposium on Granitic Pegmatites. 2015. Giller BS (2003) An overview of tourmaline mineralogy from gem tourmaline producing pegmatite districts in Africa. Master of Science Thesis, University of New Orleans, LA. Kolitsch, U., Andresen, P., Husdal, T. A., Ertl, A., Haugen, A., Ellingsen, H. V. and Larsen, A. O. (2013): Tourmaline-group minerals from Norway, part II: Occurrences of luinaite-(OH) in Tvedalen, Larvik and Porsgrunn, and fluor-liddicoatite, fluor-elbaite and fluor-schorl at Ågskardet, Nordland. Norsk Bergverksmuseet Skrift 50, 23-41. Simmons W., Falster A. 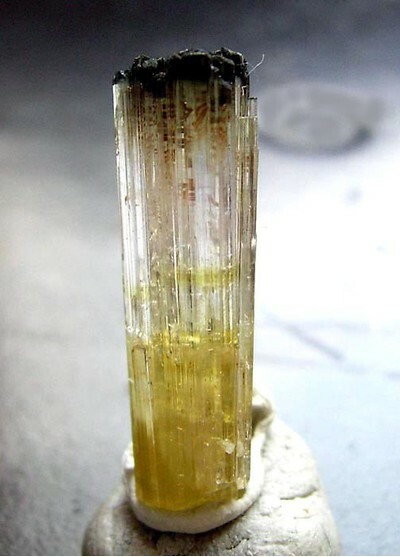 (2004) Gem Tourmaline from Congo. Gems & Gemology 40, 263-265. Pedro-Pablo Gil-Crespo, Uxue Ostaikoetxea, Encarnación Roda-Robles, William Simmons, James Nizamoff (2012): Caracterización por XRD y Espectroscopía NIR de Turmalinas de la Serie Chorlo-Elbaita-Rossmanita de la Pegmatita de Berry-Havey (Maine, USA). Macla 16, p. 222-223.; Roda-Robles, E., Simmons, W., Pesquera, A., Gil-Crespo, P. P., Nizamoff, J., & Torres-Ruiz, J. (2015). Tourmaline as a petrogenetic monitor of the origin and evolution of the Berry-Havey pegmatite (Maine, USA). American Mineralogist, 100(1), 95-109. Dyar MD, Taylor ME, Lutz TM, Francis CA, Guidotti CV, Wise M (1998) Inclusive chemical characterization of tourmaline: Mössbauer study of Fe valence and site occupancy. American Mineralogist 83, 848-864. 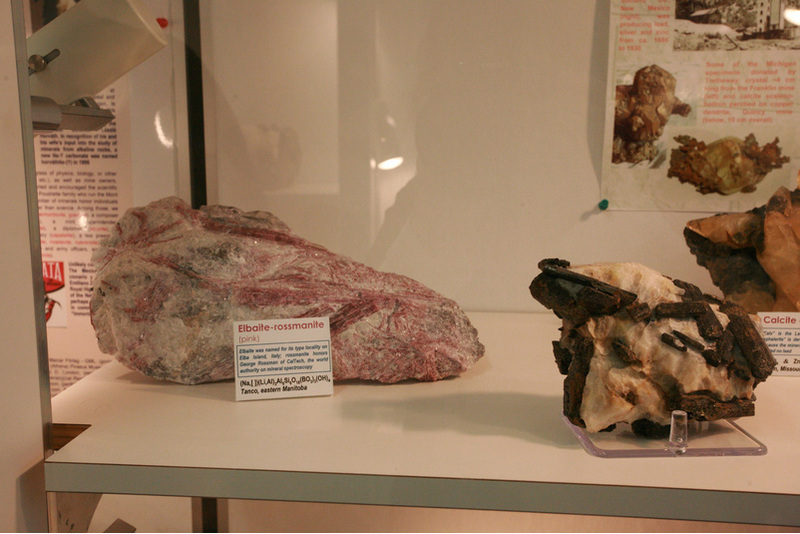 [samples 45 and 46, labeled olenite, are actually rossmanite]. Lupulescu, M. & Rakovan, J. (2008) The 35th Rochester Mineralogical Symposium, Contributed Papers in Specimen Mineralogy, 10.